A Vancouver based CEO, with all the trappings of success, a Lamborghini, international bank accounts, and multiple homes has pleaded guilty in federal court, in the Southern District of California, to running a criminal organization that facilitated the transnational importation of and distribution of narcotics through the sale and service of encrypted communication devices. Vincent Ramos 40,, aka "Business", and four codefendants, who are fugitives, were indicted in March, in San Diego, for conspiring with drug traffickers to conceal their communications from authorities using Blackberry technology introduced by Ramos, and others. 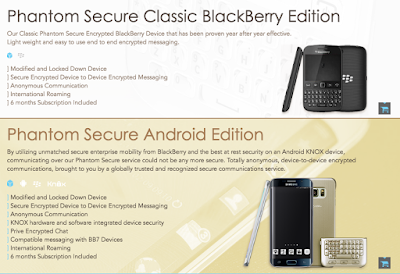 The technology allowed Phantom Secure to erase, clean, and destroy evidence on Blackberry's used by the criminal organizations. Ramos was arrested in Vancouver, while eating dinner, chicken and waffles at a popular diner, on James Street, in the sleepy hours before closing. He was alone, and having breakfast when FBI and task force members detained him, to be extradited to San Diego, where he was charged. He was denied a bail package, 500,000 in cash and property, and the offer to lease an apartment in San Diego, during the trial. His friends and family described as a successful businessman, who was a flag football coach, and devoted father. Ramos formerly sold Amway, before working for a Canadian based cellular company, prior to starting his own service in 2008. For example, an organization member who was arrested, in possession of large amounts of narcotics, could have his encrypted phone remotely wiped, by Phantom Secure, via a third party, a member of the organization. Ramos, agreed to an 80 million dollar judgement against him and his company. The judgement represents the gross income from Phantom Secure during it's time in business, and the profits derived by Ramos. The forfeiture of millions in bak accounts, the previously mentioned Lamborghini, multiple properties, Bitcoin and other crypto currencies, which Phantom Secure used to process and launder millions in transactions. Ramos servers, similar to other organizations, that have been indicted in San Diego, hosted servers outside the United States to facilitate operations. In 2013 the Portocarrero brothers, Jan and Erik, were charged with running a RICO conspiracy, an international illegal gambling operation, whose servers were based in Costa Rica. In the wake of that case, Operation O-Dawg was launched, which targeted a similar organization, who assumed many of the customers left by the Portocarrero brothers void, based in Redondo Beach, Los Angeles, and San Diego. O-Dog was ran by Owen Michael Hanson, a former USC football player. His organization trafficked cocaine, methamphetamine, Ectascy and steroids, locally, and eventually as far as Australia. Owen Hanson was indicted in 2015, and charged again, as part of a RICO case in early 2016. He plead guilty in 2017, and was sentenced to 21 years. He agreed to forfeit 5 million dollars, including homes and cars as part of the plea deal. He coordinated with a Mexico based drug trafficking organization to distribute over 1,0000 kilos of cocaine. Part of the Ramos investigation, detailed in the redacted complaint, involved Marc Emerson, a Los Angeles man, who assumed control of a drug trafficking organization, whose leader was indicted in September 2015. Emerson, was arrested with 194 kilos of cocaine in Los Angeles, in March. 2017. A few months later Emerson died of a drug overdose. A CW-1, alleges Ramos also supplied Phantom Secure phones to Sinaloa Cartel members, which CW-1 worked in concert with. Undercover agents purchased 6 months of Phantom Secure service for 20,000, and an extra payment of 25,000 dollars. These agents coordinated and openly discussed the purchase, transport, and loss of cocaine, as well as surveilling others, including Canadian based traffickers moving MDMA loads into the United States, through the northern borders. His sentencing is set for December. FBI San Diego led the investigation, which also included Department of Homeland Security, Drug Enforcement Administration, Australian Criminal Intelligence Services and Royal Canadian Mounted Police. Yes Sonny, they ate busting him for phone s, and if you read, also for drugs, did ya see the big fine..holy Macro. Odds are the RCMP did the arrest, and simply walked up to him seeing as it was in Vancouver; and the story notes that he was alone in the diner. No need to go busting through windows like they do in the movies. That said, if you think the guy running a company that knowingly allows encryption of comms for cartels isn't a big deal you may want to stop and think of the implications a bit more. Hey J, thanks, it’s about time you chimed in ! nothing more respectful that switching from amway to work with the mexican cartels or may be not. Anyone who thinks cell phones are secure are idiots. The CIA owns the satellites the cell phones and cell phone towers use. So it doesn't matter what phone brand program you run, they see and read everything. Thats why zetas tried to build their own radio towers. Even that was not a guarantee CIA couldn't intercept the signal. Except for the very rare and advanced laser communication technology. All Antrax Black Ops and Gente Nueva Special Forces Operators were using Phantom Blackberrys and Hitech 2way radios. The team was recently upgraded to CIA S.A.D satellite phones with highly sophisticated encryption and reverse engineered by our liason in the Israeli Mossad.By default all the communications equipment has the "el Jefe de la Sierra " ringtone . A corrido dedicated to El Sr Chapo Guzman. Probably could have avoided prison if he just maintained some plausible deniability—like maybe not selling to customers who openly boast about trafficking coke. He didnt leave Canada willingly from what I understood. I believe RCMP (Royal Canadian Mountain Police) escorted him to the US and the FBI had him extradited.the only thing separating Vancouver and Seattle is a bridge if I remember correctly. It's the same as Windor Ontario and Detroit Michigan.